Actions for the conservation of coastal habitats and significant avifauna species in NATURA 2000 network sites of Epanomi and Aggelochori Lagoons, Greece” (LIFE09 NAT/GR/000343), LIFE+ 2009.
to enhance the conservation status of the priority habitats at site 1: 1150* (Coastal lagoons), 1510* (Mediterranean salt steppes – Limonietalia) and at site 2: 1120* (Posidonia beds – Posidonion oceanicae), 1150* (Coastal lagoons) and of the priority species they host (e.g. Numenius tenuirostris, Phalacrocorax pygmeus). to restore the hydrological and ecological status of the Epanomi lagoon. to increase habitat heterogeneity by transforming the macro / micro-topography of the area, thus, creating new habitats that could support several flora and fauna species and enhancing system biodiversity and stability. to manage effectively visitor activities that so far, due to the lack of concrete management actions, had an overwhelming impact on the physical environment and its biota. to engage stakeholders in actual management by promoting actions and means that would inform them and “invite” them to participate in meetings and decision making. to raise environmental awareness of users (local community, farmers, tourists, other stakeholders) by constructing works of environmental interpretation, creating and distributing information material, engaging the public, especially young people (e.g. students), in activities aiming to the protection and conservation of the area of interest. to improve directly, by conclusive actions, the conservation status of the Posidonia beds, the lagoon, and indirectly, the conservation status of the species associated with these habitats, by actions of restoration and managing of human activity. to support long term protection of these habitats by launching a public awareness campaign, targeting pupils / students to make them realize the value and the richness of these habitats and to confront them with the undeniable threats and risks that human activities pose on the habitats. to promote gathering and sharing of the positive results obtained in the course of the project, so as to exchange experience and know-how with other environmental managers of similar habitat types / sites all over Europe and the Mediterranean Sea. The project has duration 48 months (start date: 01/10/2010, end date: 30/9/2014), and total budget 1.639.770, 00 €. 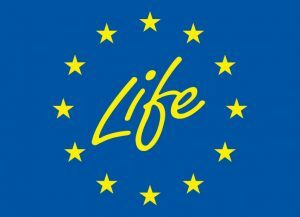 The project is financed by 75% by the LIFE+ programme.